As early as the 12th century, Otto the Rich, the Margrave of Meissen, recognised the importance of "urbs libzi" - the city of lime trees - and granted Leipzig a charter as a town, with the right to hold markets. Situated where the two most important European trade routes, the via regia and the via imperii, intersected, Leipzig developed into one of Europe's major trading and trade fair cities over the following centuries. Even today, Leipzig stands where the most important routes – from Italy to Scandinavia and from France to Eastern Europe – meet, and is home to Central Germany's major intercontinental airport. 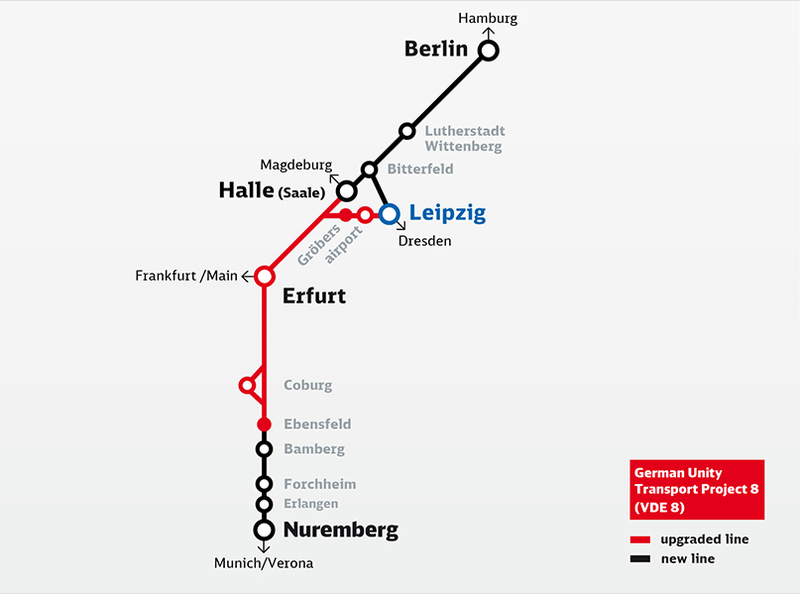 Integration of the new sections of the Berlin – Nuremberg main line, which represent the central part of the north-south axis, into the largest rail terminus in Europe, presents a major challenge to everyone involved. Platforms 10–15 at Leipzig Hauptbahnhof will be adapted to meet the applicable harmonised European standard for high-speed rail. This involves modification of platform heights and lengths. The railway bridges over Parthe Strasse and Rackwitzer Strasse in the station throat have already been demolished and partially rebuilt. The appearance will match their existing status, for reasons of historical preservation. One aspect will be clearly visible to drivers: the new bridge will no longer have a central pillar on the Rackwitzer Strasse, to remove an accident black spot. Two running line tunnels which pass below the station will be filled in during the building works. One has been disused for some time and the other currently connects the exit towards Dresden with the station. It will be realigned during construction and upgraded to allow speeds of up to 160 km/h. The entire throat will be reconstructed to integrate lines 5919, 6411 and 6363 into the station. The northern ramp of the City Tunnel has a serious effect on construction work and appropriate allowance must be made for it in planning.